7 am, Monday morning. It was a surprise to me too that I was so excited and upbeat – I couldn’t wait to start my weeks work experience at Show Racism the Red Card! Upon arrival to the office (also known as ‘the prison’ due to the lack of windows), the door to the cage of butterflies in my stomach suddenly flew wide open, but it was soon shut again as I was made to feel very welcome by all the members of the Show Racism the Red Card team. Being my first day, I was eased into my role by watching the educational DVDs that the charity organisations have made to gain some insight and background knowledge into what they do and how they help the cause. I also undertook tasks such as fetching materials from the storage space (which is also known by a nickname, ‘the dungeon’) to put together packages for an upcoming event that I would be attending later that week. My second day was my first real introduction to the world of work as my alarm went off at 6 am. And it was a good day for the work experience boy and smart phones as the sat-nav application on my mobile phone directed us to the location of the event in Lorne primary school in Edinburgh. I observed a workshop with primary 6 pupils and got in involved by assisting members of the team by handing out worksheets and other materials necessary. I also had experience interacting with the children. I felt I gained confidence in my speaking as the day progressed, as well as a sense of self-accomplishment. It was another early start the following day as I travelled to Dundee with the team to attend an event at Dundee United FC. I observed the change in delivery, as the audience today was first year pupils from St John’s high school – the members of the team taking the workshops had to approach the kids differently so that not to be patronising, but also to keep them interested and involved. I interacted in all workshops and enjoyed the overall event. And when some technical difficulties arose, some members of the team and myself solved the problem – this experience taught me to always double check equipment beforehand. On my fourth day, I was back in the office: I took messages and attended a team meeting. Through putting some of my feedback and ideas forward and receiving a positive response, I gained confidence in my own opinions. I realised how much hard work goes into running a charity like Show Racism the Red Card and that there is a lot going on behind all the posters and fun workshops. 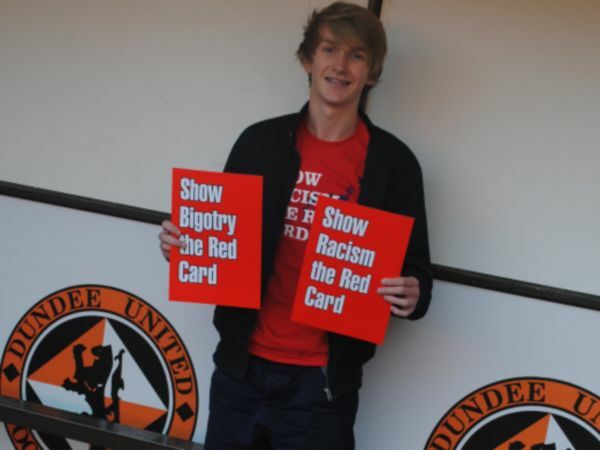 On my fifth and final day, I attended a workshop in Govan high school run by the Govan Youth Initiative Project as part of Show Racism the Red Card's Fortnight of Action. It was interesting to see the differences in how the two teams approached the message of racism. I also wrote and uploaded my web story – which you are reading now – on-line. I have very much enjoyed my work experience and I would like to thank the members of the team I have been working with and who have made me feel so welcome – Amanda Peebles, Bill Butler, Dee Kinning, Elio Ajmone and Ruth McGeoch.